Demonstrate you matching skills for all to see in Mahjong World Contest, an impressive challenge for mahjong players. After years of merely sitting on the sideline, your time is finally here. You've been invited to take part in the World Tournament of Mahjong! Starting from the bottom and hopefully working your way up the ranks, you'll encounter a myriad of boards ready to put your skills to the test. Complete over 100 unique levels of tile-matching in this entertaining Mahjong game. Experience a varying degree of difficulty and dynamics as you work to gain experience and earn points. With every completed puzzle, you'll improve your rank and progress through the game's hierarchy. Become the best Mahjong player the world has ever seen and win the master title! Download free full version game today and start playing today! 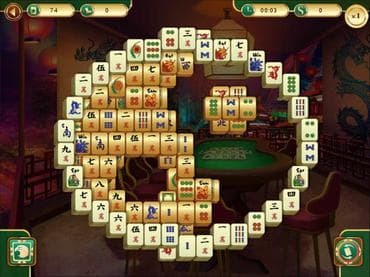 Free Game Features: - Become the Mahjong Master in this entertaining Mahjong experience; - Complete over 100 unique levels with different goals; - Experience varying difficulties and dynamics to gain experience and earn points; - Use helpful aides such as Shadow and Scramble to help; - Improve your rank and progress to win the Mahjong Master title. If you have questions about Mahjong World Contest game, please contact us using this form.